In 2010, we were moving. In 2011, we were moving. In 2012, we were living in an apartment and thinking about moving. It's 2013. We have a house. We have a garden. We have vegetables. I am loving this garden thing even more than I thought I would. Part of it is the shared excitement of doing this with the family. There's actually someone else who gets excited about news like "look, the carrots are coming up!" Peanut cheered at the table when I told the family we were eating salad from our garden. Pumpkin loves going out with a pair of scissors to cut herbs. 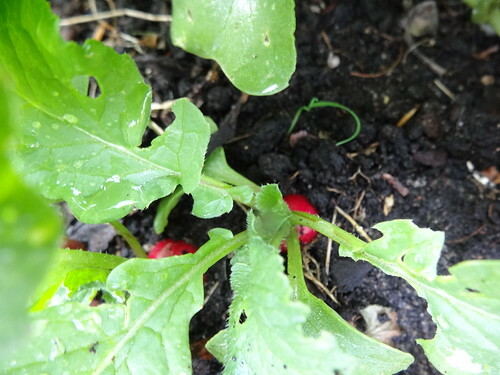 The unexpected gift of gardening has been watching the kids. Pumpkin helps with planting the seeds, dropping them into the holes or the rows and covering them with soil. Both help with watering the garden. I thought it would be my project. It's ours. This one, on the other hand, is part of my project. I've been following Carolyn's blog for quite a while now. She makes nearly all of her own clothes. It's amazing and inspiring. I'd like to be making more of my own clothes as well. 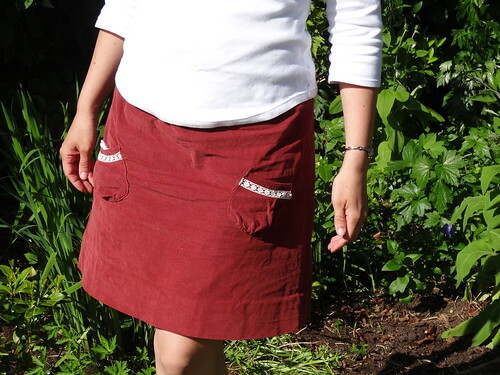 My latest project was this light weight corduroy skirt. It's based on a Sew U pattern with pockets drafted by me. It's kind of my perfect skirt, simple, easy, and comfy. The puffy pockets are great for a tissue or my iPod. It's also just for riding the bicycle, which I do often enough living here! I made the top last spring, I think. I drafted the pattern based on my favorite shirt from two winters ago. The pattern is still in progress, but it's getting better every time. I need to take in the shoulders by about a centimeter, so that will happen the next time around. The fabric is a bit too heavy. A bit more drape would be nice - and maybe make it less likely to mold to and constantly show off my little pouchy belly. Learning, learning, learning! What are you growing? Making? Learning? Loving?